RANTWICK - Commuter Cycling in London Ontario | A Bike Blog: Feisty Fort Worth Foliage Forwarded For Fun Friday FARATS Fix! 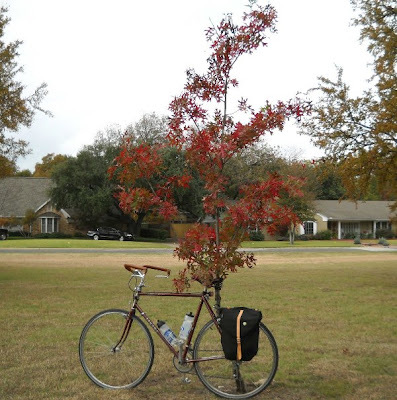 Feisty Fort Worth Foliage Forwarded For Fun Friday FARATS Fix! Here's an entry from Rat Trap Press that few will not be tempted to vote for; RTP has called it his "scrappy little Charlie Brown tree" and I must say I like it a lot. Remember every submission has a chance to win one of the two prizes, so send in your pics! RTP, I grabbed this most recent pic as your entry... let me know if I should have taken the first one and I'll do that. I don't know about how things are in other parts of the world, but man, has the cycling weather ever been awesome here in London Ontario. Frost all over everything with clear skies and bright sunlight in the mornings, temps around freezing, no snow. The scenes on the bike path along the river on my way to work are just mind-blowingly beautiful. I've tried taking pictures, and they look nice, but they fall quite short of showing how sweet the rides have been. I wish every one of you those kinds of rides this Autumn, hopefully this weekend! You've picked the best photo, it shows Charlie B. in all his glory. I've tried taking pictures of peace and fun. They just don't convey it. It's a case where the picture does less justice than well chosen words. Its turned cold here in vancouver, and the tops of the north shore mountains are sporting a tiche of white stuff. May be gone the next sunny warm day, but forecast calls for rain which, at that altitude, means snow. There goes summer! There goes fall! It's been awesome here in Indiana also. Like cafiend says, pictures can't adequately capture the beauty of this weather, especially at this time of year.